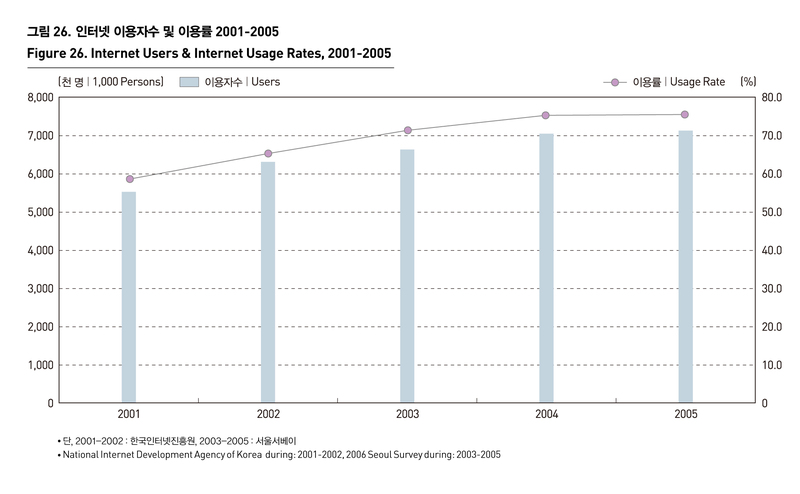 2005년 서울시의 인터넷 이용율은 75.5%이고, 가구당 컴퓨터 보유율은 85.7%에 가깝다. 이는 지난 수년간 일정한 수준을 보이고 있다. 구체적으로 살펴보면 서울시의 인터넷 이용자수는 2001년의 5,480천명(이용율 58.2%)에서 증가하여 2003년 6,590천명(이용율 70.9%)을 넘어 정점을 이룬 후 증가세가 둔화된 상태이다. 가구내 컴퓨터 보유율도 2000년 78.8%에서 증가하여 2002년 89.0%에서 정점을 이룬후 증가세가 둔화된 상태이다. 인터넷 이용율을 지역적으로 살펴보면 75% 이상의 이용율을 보인 자치구는 강남구, 강동구, 강서구, 광진구, 노원구, 서초구, 송파구, 양천구이며, 매일 이용한다는 사람의 비율이 50%를 넘은 자치구는 강남구, 서초구로 나타났다(2005년기준). 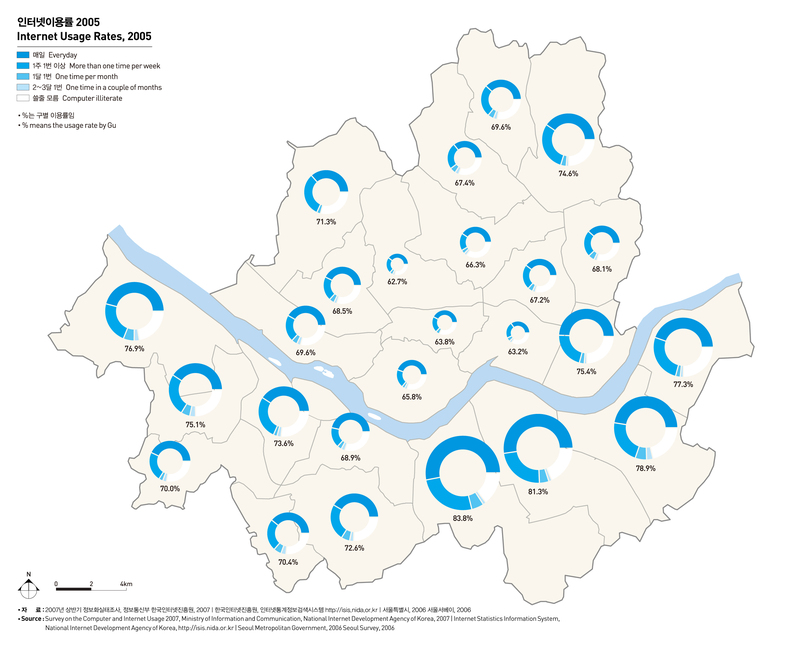 The internet usage rate stood at 75.5%, and the percentage of households with access to a home computer reached 85.7% in 2005, and there has been no significant change in information and computer usage over the last couple of years. The number of Internet users climbed from 5,480,000(58.2%) in 2001 to 6,590,000(70.9%) in 2003, and the growth trend has slowed down thereafter. 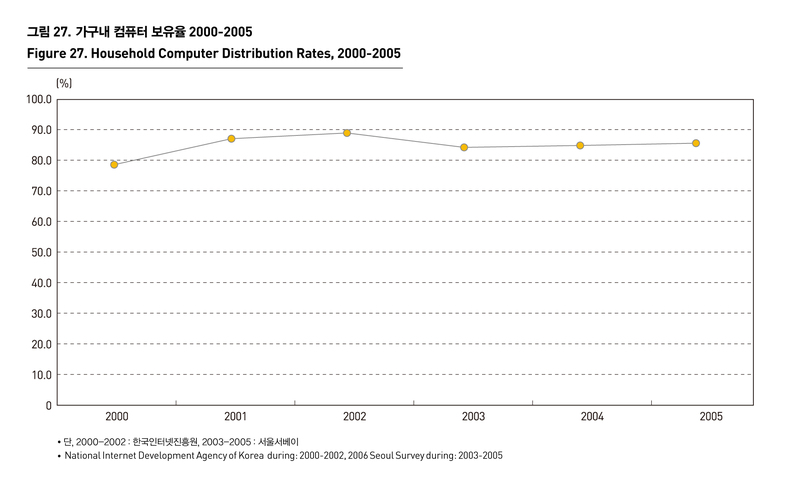 The computer distribution rate grew from 78.8% in 2000 and peaked at 89.0% in 2002. More than 75% of citizens have access to internet connection in Gangnam-gu, Gangdong-gu, Gangseo-gu, Seocho-gu, Songpa-gu, and Yangcheon-gu, and more than 50% of people log on to the internet every day in Gangnam-gu, and Seocho-gu(as of December 2005).